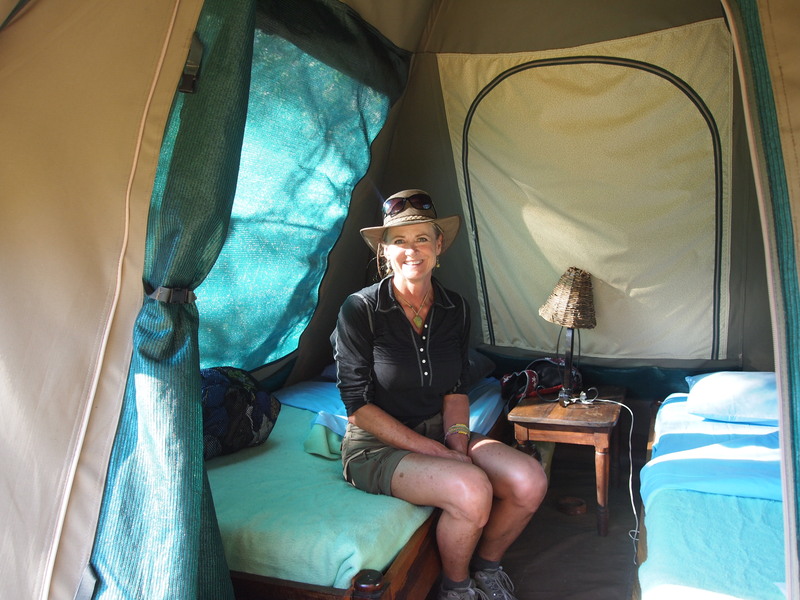 Although my G Adventures 35 Day Overland Truck Adventure was challenging because of the long bumpy driving days, the lack of creature comforts while camping, and being in close confines with a diverse group of people (ages, nationalities and personalities), the rewards were tremendous! By day 19, some of the highlights had been Fish River Canyon in Namibia (see my post here); Dune 45 and Deadvlei Salt Pan in Namibia (see my posts here and here); Etosha National Park in Namibia (see my post here); visiting the San Bushman in Botswana (see post here); the Okavango Delta in Botswana (see posts here and here); and Chobe National Park in Botswana (see post here). Her trip was ending here, so the last two evenings, I had the tent to myself and had to pay $15 per night. There were only 5 of us from the original 17 that were going all the way from Cape Town to Zanzibar or Nairobi, and we were getting a new Overland Truck, Tour Director and driver, along with some new passengers. The following day, Kelly, Timo (from Germany) and I left at 8am for Victoria Falls on the Zambia side (it’s a full day excursion if you visit both sides like we did – we didn’t return until 4:30pm). 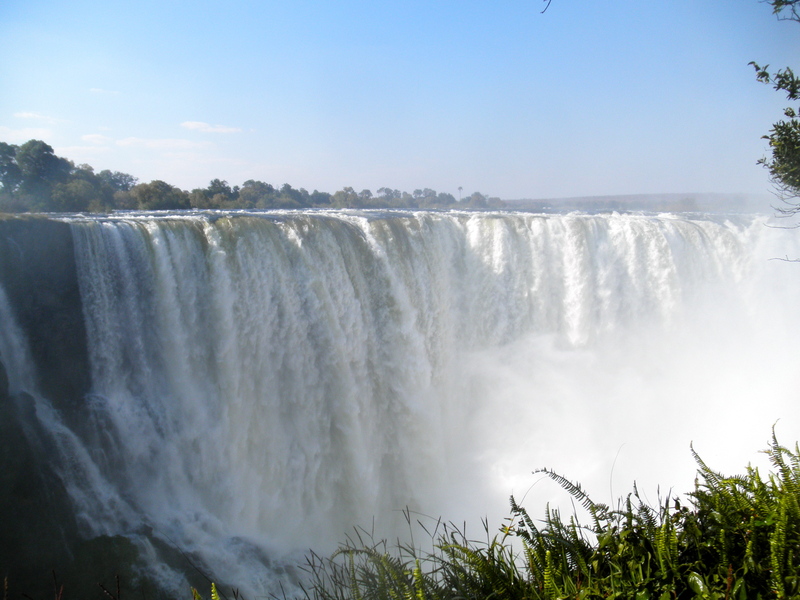 The falls are over a mile wide and 354 feet deep and are also known as the “Cloud (or Smoke) that Thunders”. Here is one of our first views…. 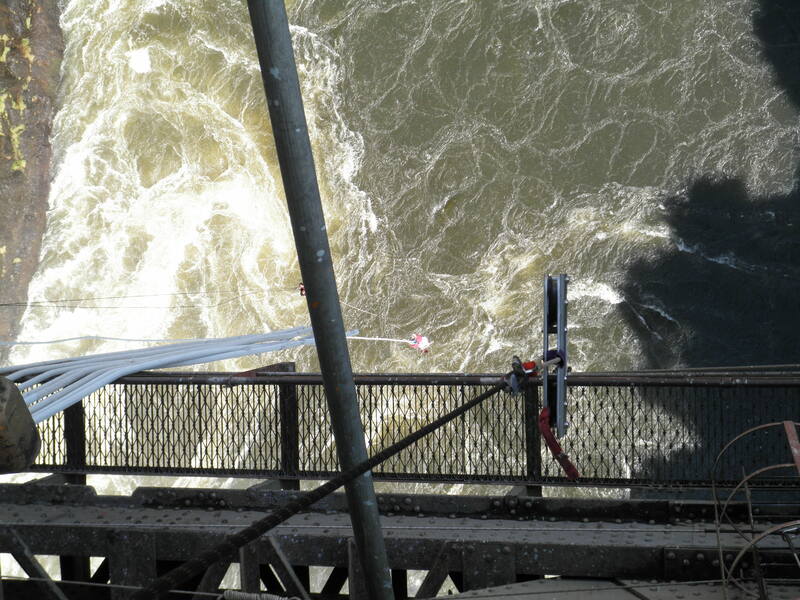 We crossed the “Knife Edge” bridge and were drenched from the spray of the pounding water. I felt like I was part of the falls! There were rainbows everywhere!! Next, we hiked down over 350 feet to the “Boiling Pot” at the water level and watched the swirling water! 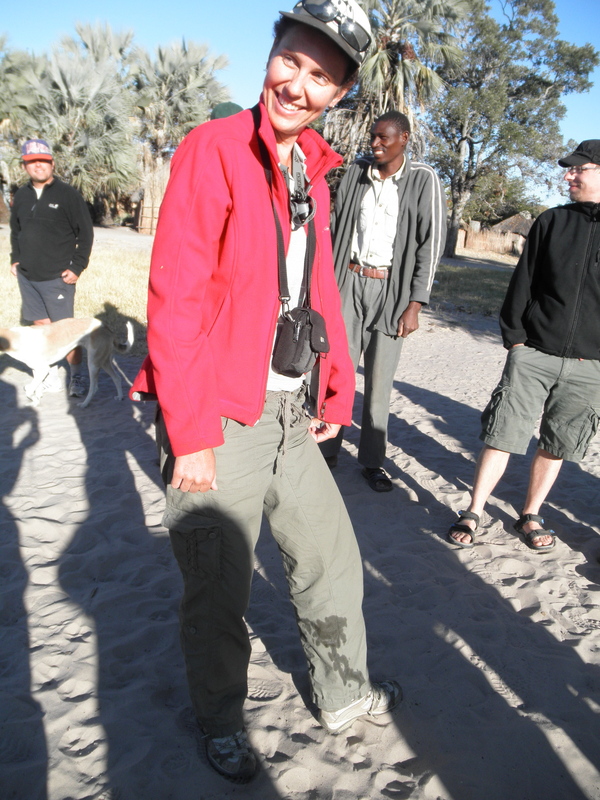 There were quite a few baboons on the trails and suddenly one of them jumped up at Timo and scratched his arm. It thought he had food. He was quite shocked and a bit concerned afterwards about disease. We gave him a wet wipe and some hand sanitizer for it. Later we heard another one of the girls in our group had one jump on her backpack and try to scramble away with it. 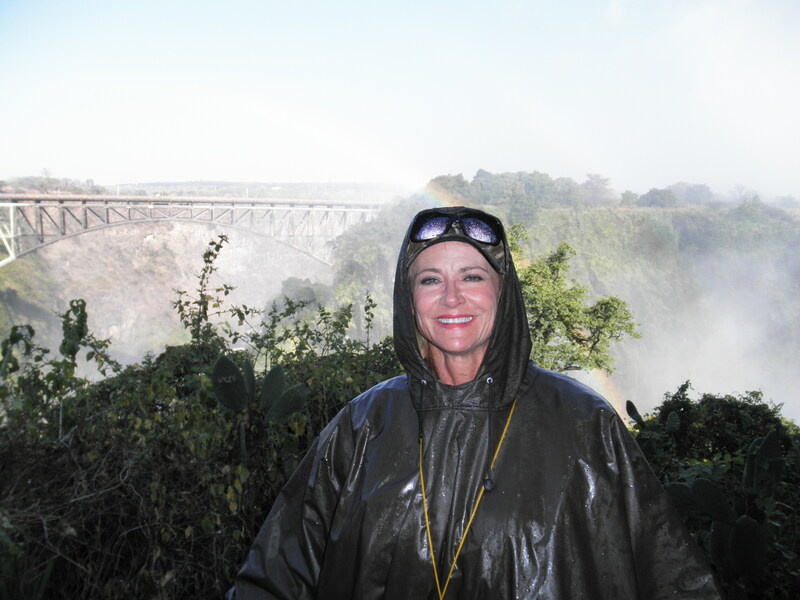 After consulting with a few people, including our Tour Director, we decided to pay the extra money to walk across the bridge into Zimbabwe to view the front side of the falls. I had read that it was a must do! When we inquired of a local which side was better, he said it was similar to asking which side of his face was better. 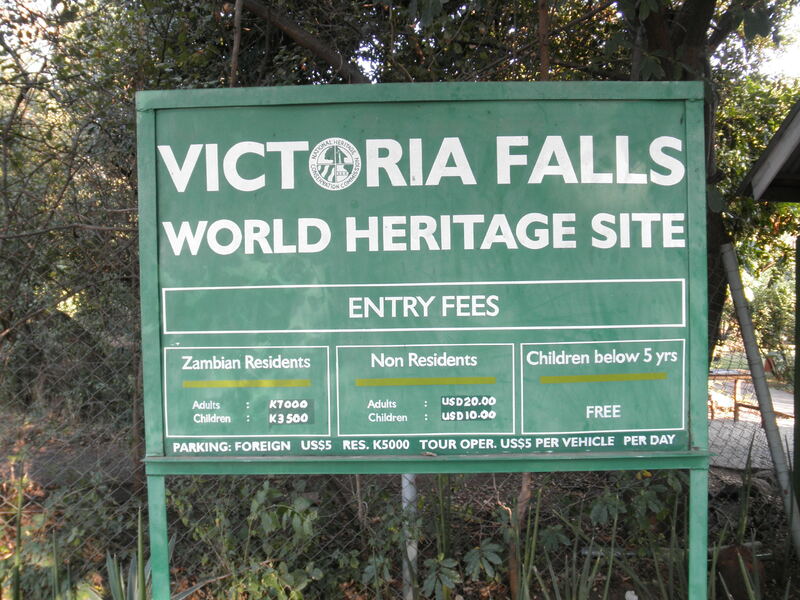 If I remember correctly, I had to pay $30 extra for a double entry Visa for Zambia, $30 for a Visa to enter Zimbabwe, and $30 to enter the falls on the Zimbabwe side. 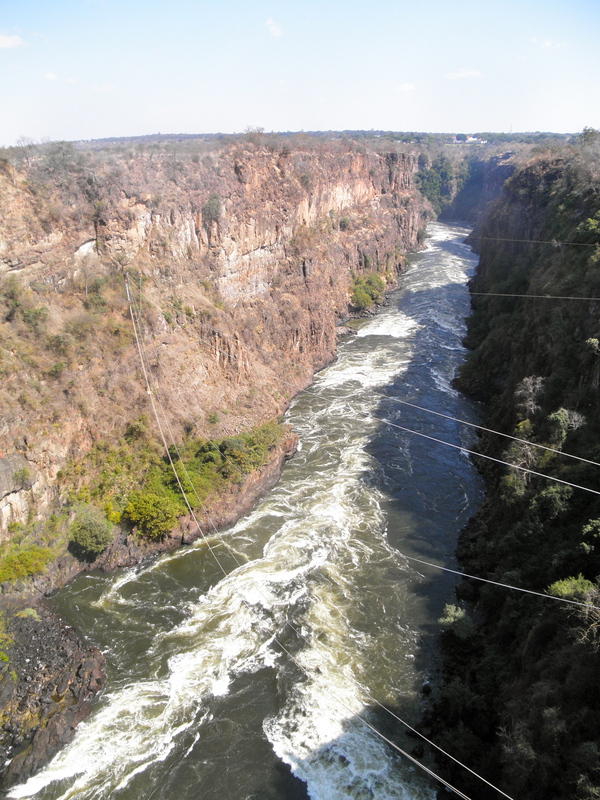 We decided to walk across the bridge rather than take a taxi (no man’s land – since you’re really not in either country) and we stopped to watch a girl bungee jump. 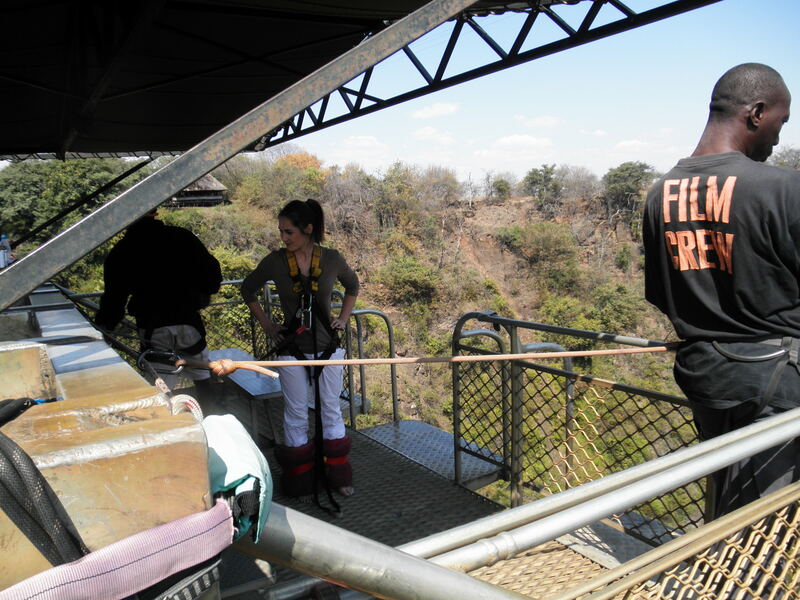 This was the bungee jump that broke a while back and a girl broke her collar-bone, but survived! Here she’s ready to jump. And here she is dangling down below…. As you can see, the falls are spectacular! Although photos don’t do it justice…the spray from the water doesn’t lend itself to great photos! 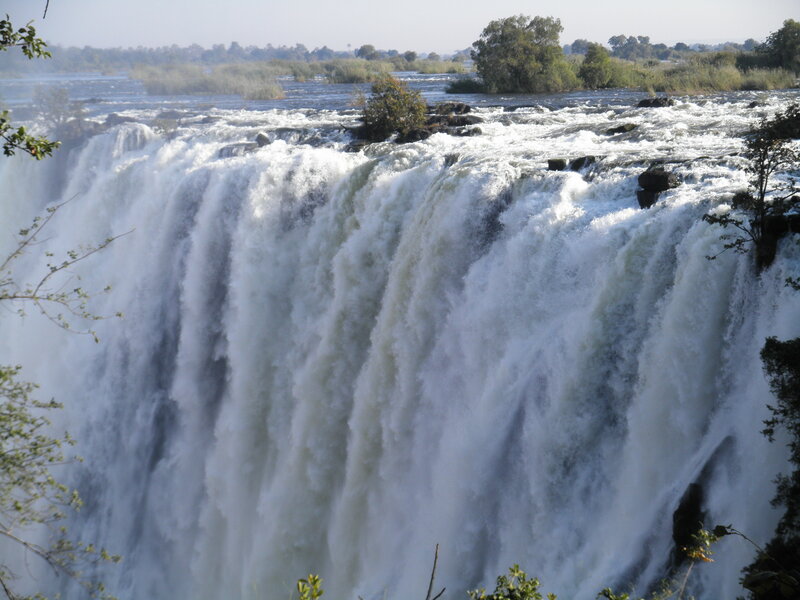 From September to January you can see the falls really well because it during the dry season. But then you miss the experience of the thundering powerful falls. I was surprised at how few people we encountered! If you are able to visit Victoria Falls, I definitely recommend seeing them from both sides!